Are We Safe Enough? 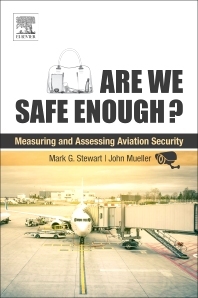 Measuring and Assessing Aviation Security explains how standard risk analytic and cost-benefit analysis can be applied to aviation security in systematic and easy-to-understand steps. The book evaluates and puts into sensible context the risks associated with air travel, the risk appetite of airlines and regulators and the notion of acceptable risk. It does so by describing the effectiveness, risk reduction and cost of each layer of aviation security, from policing and intelligence to checkpoint passenger screening to arming pilots on the flight deck. Mark G. Stewart is Professor of Civil Engineering and Director of the Centre for Infrastructure Performance and Reliability at The University of Newcastle in Australia. He is co-author of Probabilistic Risk Assessment of Engineering Systems (Chapman & Hall, 1997, and Japanese edition in 2003), and has published more than 400 technical papers and reports. He has 30 years of experience in probabilistic risk and vulnerability assessment of infrastructure and secu¬rity systems that are subject to man-made and natural hazards. Professor Stewart has received extensive Australian Research Council support, including an Australian Professorial Fellowship, to develop probabilistic risk-modelling techniques for infrastructure subject to military and terrorist explosive blasts, and cost-benefit assessments of aviation security, policing, and counter-terrorism protective measures for critical infrastructure. John Mueller is Woody Hayes Senior Research Scientist at the Mershon Center for International Security Studies and Professor of Political Science at Ohio State University, as well as a Senior Fellow at the Cato Institute. He is the author of over a dozen books, several of which have won prizes. Among the most recent of these: War and Ideas (2011) Atomic Obsession: Nuclear Alarmism from Hiroshima to Al-Qaeda (2010), Overblown (2006), and The Remnants of War (2004). He has also edited the web book, Terrorism Since 9/11: The American Cases (2017). Earlier books include Capitalism, Democracy, and Ralph’s Pretty Good Grocery, Retreat from Doomsday, Astaire Dancing, and War, Presidents and Public Opinion. He has published hundreds of articles in scholarly journals and general magazines and newspapers, is a member of the American Academy of Arts and Sciences, and has been a John Simon Guggenheim Fellow.